Georgina Fernweh has always known two things to be true: all the women in her family have manifested magic in a variety of forms and her island home is known for the rare three-hundred-year-old bird that visits once a year. It's now her last summer before she leaves the island to go away to school, the last summer before the window for her to manifest her own magic closes when she turns eighteen and, though she doesn't know it yet, it's going to be a summer that will change her life forever. Plot? It's about twin sisters, and the magic that flows through the blood in their veins as part of their family legacy. It's also about their island home (and the rare bird they are known for), and the last summer they will be spending there together before they leave for school. It's about falling in love, growing up and learning the truth about yourself and other folks. I genuinely admired Leno's ability to weave these plot threads together, and thought everything was handled with a deft hand. Characters? I like the characters in this one well enough, though I wouldn't consider the particularly memorable. Georgina makes for an intriguing narrator, with her perspective on the world, her experiences as she navigates growing up, the things happening on the island and her own relationships. She's joined by other characters I liked - her twin sister, the birdwatchers that come to the island every year (or, in the case of this story, for the first time ever), her friends, her mother and the residents of the island. Writing? If there was anything about this book that immediately cemented my interest in it, it was certainly the way Leno wrote her story. There was something about the narrative - the character voice, the employed language, the pacing in tandem perhaps? - that really hooked me right from the start. I flew through this story in a matter of hours, which is testament to both how intriguing the plot was and how it was written. Overall? 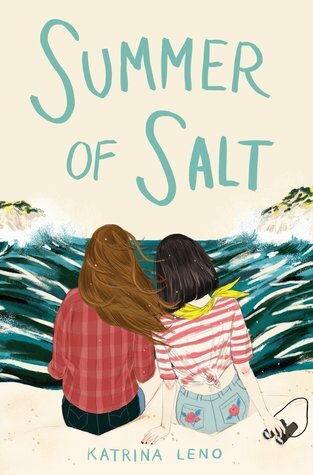 I liked Summer of Salt a lot! It's the kind of magical realism-meets-contemporary coming-of-age story that I'm really into, and it features sisters as a main aspect of the story. Well-written, interesting and quick, this is definitely a novel I think is worth checking out. Island you want to visit? There are so many islands I'd love to visit in my lifetime, but one of the places I have always wanted to go to is Maldives, which is technically a chain of islands. It just looks like such an incredible place! I can imagine myself visiting for a week to just relax, enjoy the sun and the views and eating all the delicious food I can manage. I'm so glad you also enjoyed this! I LOVED the writing, and I thought the setting was so atmospheric. Plus, the fabulist elements were really cleverly incorporated. And I'm ALWAYS here for an f/f romance! This book was just so magical!